The Bride's Choice in Plantation gave away 100 free wedding dresses to women who are without work. 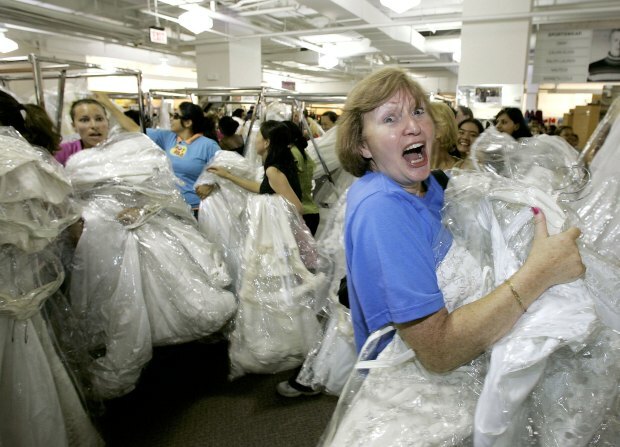 Over 100 soon-to-be brides made jobless in Florida's lousy economy will get to walk down the aisle in style after a Plantation boutique gave away free wedding dresses to the down on their luck women yesterday. Patricia South's The Bride's Choice gave the gowns away after going through inventory and discovering several dresses that were samples or simply left behind. "It's a magical moment, and every bride, whether she's having her wedding at a cathedral or her back yard, deserves to have those memories," South told the Miami Herald. The giveaway was open to Florida residents only, but South said she got calls from brides as far away as Indiana and Kentucky. A South Florida wedding dress maker is giving brides a wedding gift they can wear - free, new gowns. Control your Bridezilla and head to The Bride's Choice. Please, no runaway brides. Not having to shell out hundreds for a dress was a welcome relief to the cash-strapped brides. "When you lose your job, even if it's circumstances outside of your control, you can't help but feel like a loser," said Jasmine Marsden, 24, who lost her job a week after getting engaged. She came all the way from Daytona Beach to snag a $1,100 white silk dress for her August 2010 nuptials. Though brides said their exchange of vows would still be modest, South said every bride needs a gown for their special day. "Even if it's just you and your husband, every couple deserves that magical moment when the husband sees his bride in her wedding dress for the first time," South said.